Invite light-hearted and high-spirited interaction to exercise mind, senses, imagination and body, to engender creativity, and deepen relationships. 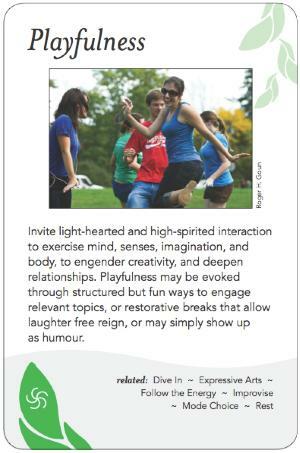 Playfulness may be evoked through structured but fun ways to engage relevant topics, or restorative breaks that allow laughter free reign, or may simply show up as humour. Play is a purposeful enjoyable activity, not "just fun". In the context of group process, play varies from unstructured to very structured (games). It can have enormous value -- it is the way in which many people learn best --and it can produce social skill-building, creativity, exercise, and memorable experiences. Laughter accesses a part of ourselves, deepens interaction with others and increases self-awareness. When the facilitator is having fun too it is contagious and exemplary. Play often frees the group from inhibitions, bonds the group, levels the power dynamic (democratization), and lightens and depersonalizes what might otherwise be tense situations. Play can entail role playing. Games are a more formalized form of play.